Beach House 8 is a luxury condominium building that was developed by Ugo Colombo and Valerio Morabito in Miami Beach. The eight in the name is the number of condominium units the building has, including the penthouse. Prices for the units were between $6 and $8 million, with the penthouse for $14 million. As of June 2014, all of the units are sold including the penthouse, which was sold to a Brazilian business mogul and billionaire. This building was created with luxury in mind for every detail from the structure, exterior design, interior design and amenities. Each unit includes Boffi Kitchens, marble countertop from Italy, efficient LED lighting, prewired for telephone, TV and internet. In addition, each unit has home automation systems that allow owners to control audio, video, HVAC, lighting and windows. The building features include two parking spots for each unit (3 for the penthouse), fitness center with technological equipment, private pool and jacuzzi. The penthouse includes 6,000 sq. ft. of outdoor living space over two floors. Moreover, it has a master guest suite as well as a private pool. It is amazing how quick Miami Beach properties are selling, but it is easy to see why when Beach House 8 is so luxurious. This entry was posted in News and tagged beach house 8 miami, CMC Group, Ugo Colombo, ugo colombo beach house 8, ugo colombo cmc group, Ugo Colombo The Collection on June 20, 2014 by Ugo Colombo. Plans are being developed for a luxury condominium tower in the Brickell neighborhood at 1001 S. Miami Avenue by Ugo Colombo and Russian billionaire Vladislav Doronin. The tower is named the Brickell Flatiron and was designed by Architect Luis Revuelta. It will stand at 710-feet tall or 64 stories. This will include 40,000 square feet of retail space and 549 residential units. 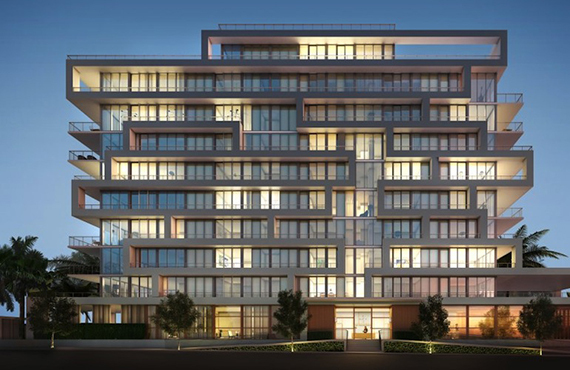 Furthermore, the building will have floor-to-ceiling glass exteriors throughout and the condo units will have 11-foot deep elliptical balconies. The average condo unit size is 1,200 square feet with prices starting at about $400,000. The Brickell Flatiron tower is planned to have two swimming pools (one on the roof), a spa, fitness center, 24 hour security and valet. In addition, the tower will have a business center with conference rooms, game room, movie theater, recreation rooms and more. The building will boast high-speed elevators with a ground floor featuring restaurants and retail boutiques. It is positioned less than a half a mile from the Brickell City Centre, which is a new luxury mall that is being constructed with an expected competition date of late 2015. The Brickell Flatiron tower is expected to break ground by the end of 2014. This entry was posted in News and tagged brickell flatiron miami, CMC Group, Ugo Colombo, ugo colombo brickell flatiron, ugo colombo cmc group, Ugo Colombo The Collection on June 1, 2014 by Ugo Colombo.